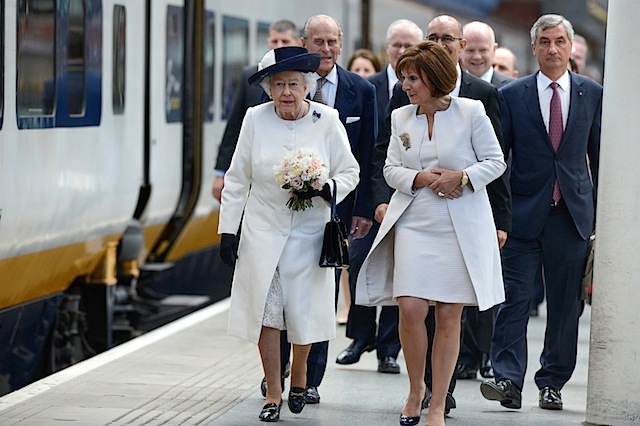 Her Majesty the Queen, accompanied by His Royal Highness The Duke of Edinburgh, took a visit to the Eurostar terminal at St Pancras International today. She unveiled a plaque to mark 20 years since the opening of the Channel Tunnel and high speed services between the UK and mainland Europe. The event preceded the Queen’s state visit to France. During her 3 day trip she will attend events in Paris and join other heads of state commemorating the 70th anniversary of the Normandy Landings. Since 1994, over 65 million vehicles and 330 million passengers have travelled on services through the Tunnel. Possibly today we take this direct connection to the continent slightly for granted and it’s hard to think back to when it didn’t exist. Prior to Eurostar, train travellers crossing the channel would have spent 2 hours on a train from London to Dover, waited for a ferry or a hovercraft and then easily another hour on a train from Calais to Paris. The current Eurostar train was first introduced into service in 1994 carrying 750 passengers and operating at speeds of up to 300kph. Since then, the fleet of 28 trains has carried over 145 million passengers between London and mainland Europe. Following their refurbishment these trains will continue to form a core part of the Eurostar fleet. The new Eurostar e320 train will carry more than 900 passengers at speeds of up to 320kph.